These seventeen exceptionally well-written essays explain that an unprecedented explosion of data injures the restorative nature of certain important ways of thinking. 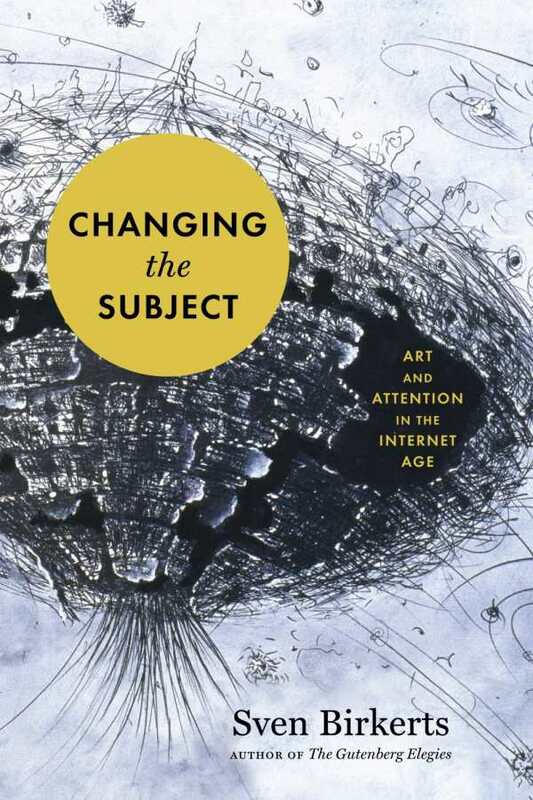 Sven Birkert’s Changing the Subject: Art and Attention in the Internet Age is a vivid and eloquent look at how technology affects our reading habits and, ultimately, injures the restorative nature of material culture: novels, letters, bookshelves, and record-store shopping. The new information culture—e-mail, e-readers, online news aggregates, apps—results in a trend of merely harvesting facts, Birkerts writes. What’s lost, or “demoted,” is certain ways of thinking—namely, reflection, imaginative projection, and contemplation. This is not just another book demonizing technology while advocating mindfulness. Instead, Birkerts, an American essayist and literary critic, uses literature and poetic observation to exalt the aspects of culture that are overshadowed by what he calls the “unprecedented explosion of data.” He writes beautifully on the inherent experience of reading a novel, writing a letter, or even navigating a map. He argues that there is inherent value in a book and its ideas, taking up physical space in your hands and surroundings. Likewise, he describes the benefits of getting lost and feeling unconnected as chances to pull attention into one’s inner world. The seventeen essays, most of which have been published in scholarly journals, are not only exceptionally well written but also authoritative. They touch on decades of debate on the role of culture and the self, with references to literary greats like Virginia Woolf and contemporary essayists writing for The Atlantic.